Michael Tshehla Phahlane, the man who gave Soweto its name back in 1963, slipped away quietly two weeks ago without a single mention in local media despite the fact that he was the real doyen of black journalism and one of its finest wordsmiths. He was 97. His huge significance in South African journalism in general and jazz writing in particular was a fact that the media were evidently unaware of. The man nicknamed “The Indestructible” because of his legendary reputation for having survived a number of near-death experiences lived most of his life in obscurity and died in oblivion, thanks to an uncaring, insensitive and oblivious society. He was the invisible man in the real sense because South African simply refused to recognise the squat, forlorn figure who roamed the streets of Johannesburg as one of the city’s homeless people. He lived a hard and undignified existence, not out of his own choice but because as a country we failed him. Born in 1921 in the old Sophiatown, in 1943 he joined Zonk, the first English language magazine for African readers. He covered a number of beats, including crime reporting, but distinguished himself as a jazz critic, definitely the first one on the continent. He wore his passion for this noble art on his sleeve, and with his elegant but cheeky prose championed its beauty and cause on the pages of the racy publication. Jazz introduced him to a young and lanky pianist from Cape Town. He loved the shy musician’s efforts on the ivories but he didn’t like his name. Adolph Johannes Brand didn’t have a showbiz ring to it. So he gave his protégé a new identity – Dollar Brand. The intrepid scribe reasoned that a dollar was the world’s most powerful currency at the time and his charge was destined for bigger things in the US, a brand that everyone wanted to experience. Years later after he went to the US as an exile, the protégé expressed his gratitude when he recorded Bra Timing From Phomolong, a tribute bluesy, meditative hymn that came straight from the soul of Soweto. It can be found on Abdullah Ibrahim’s 1989 album The Mountain. And the old timers will remember Heyt Mazurki, after the legendary 1977 encounter with saxophonist Buddy Tate. In 1983 Phahlane Sr was diagnosed with amnesia and confined to Sterkfontein Hospital, a psychiatric institution in Krugersdorp for the mentally challenged, as a state patient. One of his inmates was Dimitri Tsafendas. Another one was journalist Basil “Doc” Bikitsha, best known among his acquaintances as Carcass. When Prime Minister Hendrik Verwoerd was assassinated in 1966, Phahlane had quipped that Tsafendas had exterminated apartheid. The authorities never forgave him for that. His institutionalisation cost him enormously. He lost his Soweto house and other priceless belongings. “A vengeful father-in-law auctioned off my property just before the authorities sent me to Sterkfontein because I divorced his daughter,” he told me in a 2004 interview. 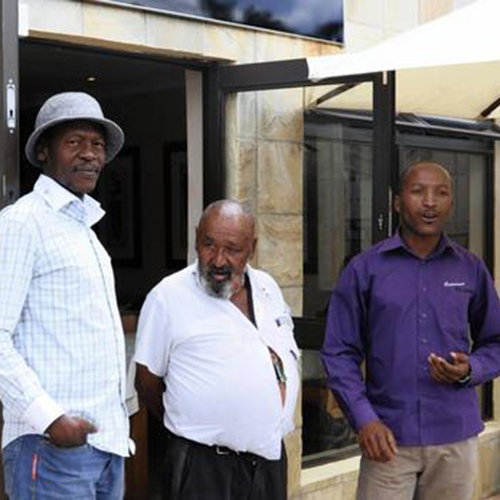 Since his release from the psychiatric institution in 2003, Ntatemoholo Phahlane – as the indomitable nonagenarian preferred to be addressed in his twilight years – had been struggling to get an RDP house. He initiated a series of correspondence with the former Gauteng premier, Mbhazima Shilowa, and the Gauteng Department of Housing. His pleas fell on deaf ears. In his halcyon days he earned the nickname Mike Mazurki, after an American professional wrestler who distinguished himself in Hollywood playing tough characters ranging from bouncers to gangsters. And true to his moniker, he feared no one – including Sophiatown’s dreaded gangs – the Americans, Berliners, Vultures as well as those in neighbouring Alexandra – the Spoilers and Msomis. A man about town, his penchant for the best attire on the market was peerless. “Mazurki dressed like a typical American newshound – broad-brimmed hat (fedora they called it then), background or Widmark (mackintosh), sleek Florsheim, Robblee or Nunn Bush shoes and other US-made clothing he had a strong penchant for,” Bikitsha wrote in a Sunday Times column headlined “My adventures with the don Quixote of Soweto”. As editor and columnist at Zonk, he penned a must-read column called Swingcerely Yours. There couldn’t have been a more apt name for a jazz column during the swing era. Although Zonk was primarily about the performance arts and was hardly political, it was only a matter of time before it caught the attention of the newly elected apartheid masters. The constant scrutiny and harassment eventually forced owner Ike Brooks to sell the magazine in 1958. Phahlane resigned in protest and urged his colleagues to do the same. Other publications he subsequently worked for included included Drum, Golden City Post, The Rand Daily Mail and The World. In 1959 he won a £10 prize for coming up with the name Soweto after a Joburg city council competition. He’s also credited with coining monikers Kofifi, Dark City (Alexandra) and Rockville (Moroka).